It is a strange thing to stand with your family and watch a loved one die. I suppose that has a lot to do with the way we handle death in our country, our rejection of the end of life and what that means, our attempts to try and cling to and continue our lives for as long as possible. We teach each other that we must fight death, not embrace it, respect it. Other cultures have a closer relationship with death, a better relationship with the passing of a loved one. Still, as we stood around my mother’s hospital bed and waited for her final breaths to come, it felt odd to me, and right to me. We both longed for an end to her suffering and regretted seeing her leave our lives. It was a powerful moment, and I am glad that I could be there for it. That I had arrived in time. She waited for us. On Saturday morning, as the final hours of her life began, she made her wishes known. What songs to play at her funeral, what people to invite, who she wanted to speak. And then she told them to get Eddie and Jeffery. She waited for her two remaining sons to arrive from their distant homes as she passed into delirium and a drug-induced state of semi-consciousness. My dad called me at 7:00AM and told me I needed to get to Maine. I’d heard that pain in his voice once before, when my eldest brother was dying, and although I still held out some hope that she would recover – no one ever said she was on her deathbed, only that she was ailing and wanted us near – we immediately packed, sent messages to our work places, and hit the road within an hour. Needless to say, I didn’t pack enough of what I needed and ran out of clothing long before we returned home. I didn’t even have nice clothes for what was to follow. My only pants were the dirty jeans I’d grabbed from the top of the laundry pile. Thirteen hours later we made it, after a grave error with GPS that led us off the highway and onto back roads, thinking we could avoid tolls and still get there quickly. Two hours of time lost, but we made it in spite of that. She’d been pretty much out of awareness for hours, so I’m comforting myself that those two hours didn’t matter and she wouldn’t have been awake even if I’d arrived at 7:00 instead of 9:00 that night. I got some time alone with her to say my goodbyes, tell her what an amazing mother she was, that I know she did the best she could with the materials she had at hand, and that any failings were of my own doing, not hers. She didn’t hear me. It didn’t matter, the words were for my comfort, not hers. The process of dying is about the living more than the dead, a celebration of life, a chance to put grievances behind us and come together once more. We waited for my father to make the decision to turn off her drugs, the remaining life support. He had trouble with it, kept asking each of us if we thought he should. It was her wish, though, and he finally made the call. Eight years earlier I’d watched my oldest brother die. The moments are remarkably similar. Both unconscious and heavily sedated. Both waiting for… something… someone. Their last few breaths further and further apart, little gasps and gulps that seemed almost labored. Like they craved air, but didn’t want to be bothered with the effort any longer. Then it was over, and they were gone, and our lives were emptier for their loss. I’ve grieved much harder for him, for he was young and life was cruel to him in so many ways, none of them his own doing. 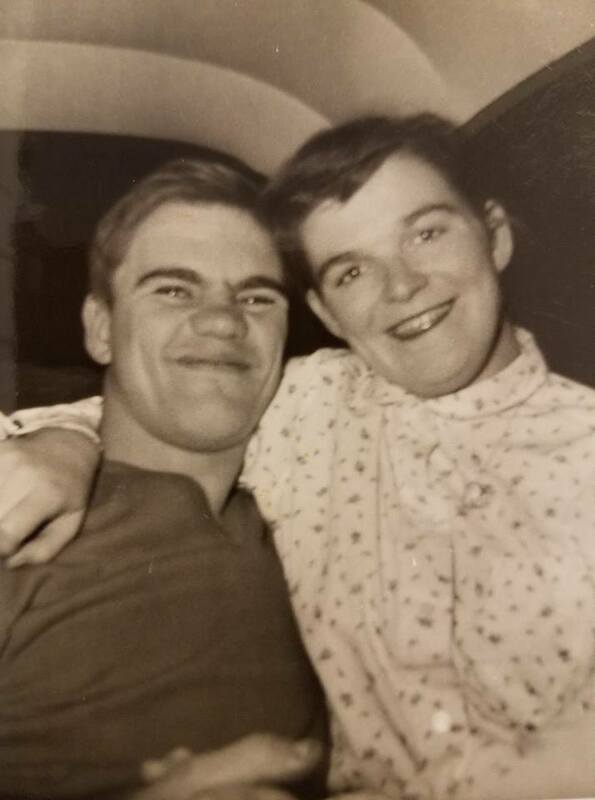 My mother I grieve for in a different way, but with the knowledge she had lived her life, done it on her terms, and didn’t have to apologize to anyone for who or what she was. And with the knowledge that her smile made an impact for so many people she met. I kissed both of them goodbye, and told them I had come, and that it was okay if they had to go, I understood. I loved them. I’ve been grieving since early Sunday morning. We’ve shared many laughs since then of course, as the family came together and we swapped stories of our childhood. As we prepared for the funeral that would come. As we contacted distant relatives and broke the news to them. The days that followed were the whirlwinds that they always are, though I had the luxury of a hotel room in a town twenty miles away so I could put more emotional distance between myself and the pain. Eddie, meanwhile, went through old photos and paperwork, discovering things my mother had kept for decades. Every tax return since 1961, filed in order. Every bill she paid. Even an old overdue bill from the Gardner library for books I’d forgotten to return. She’d paid the fine for me and never told me (in truth, I don’t even remember using that library, or the books that were listed). I have that now in my possession and will frame it for posterity, as both a reminder of my love of library and books, and a tribute to my mother who cared so well for all of us. 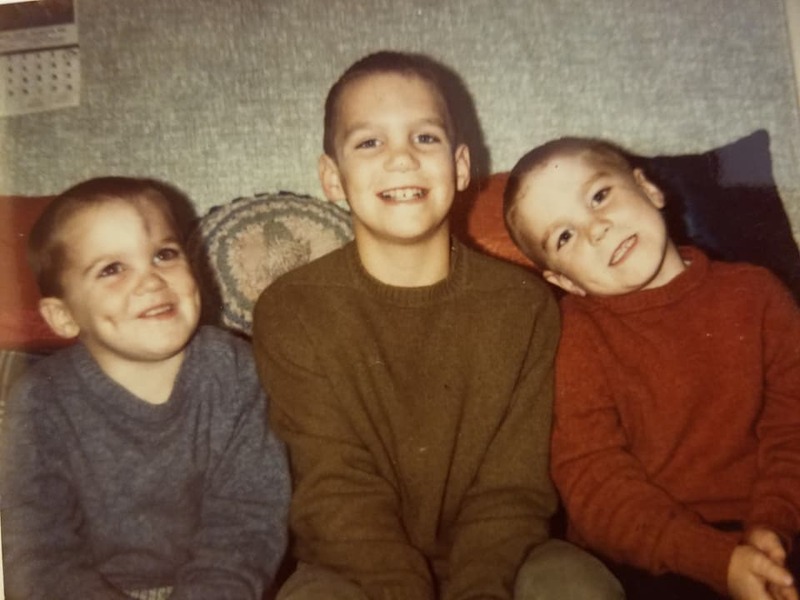 The Reynolds boys, with Stephen in the middle. I’m on the left, Eddie on the right. The funeral industry itself is a strange thing. The Shorey-Nichols funeral home handled both losses for us. They did a marvelous job in both cases, too. The owner and his wife, Glen and Rachel, are incredibly supportive, understanding, and detail-oriented. There is nothing the family needs do except determine how they will pay and how much they can afford. In both cases, there was money available. Stephen had saved all his life, not having much to spend on or any great needs. My mom had a life insurance policy she’d taken out that covered almost all of the costs. They helped us pick out a casket, and I have to stop here and say that caskets are a marvel of modern wonders. They come in so many sizes and colors, with little features you’d never expect. Like a built-in platform that can be raised and lowered so that the loved one can be more easily viewed by the grieving. We got an off-white casket with tints of pink, my mother’s favorite color besides blue. They prepared the body of course for the viewing. We’ve all heard or seen shows where the characters say that a deceased person “looks so natural,” and its true. She looked at peace, as though asleep. Only the coldness of her skin when I touched her hand betrayed the truth (as if watching her die, or her body lying in a casket weren’t evidence enough). The viewing was Tuesday evening, and many friends and family came. The funeral home put out some food and drinks, arranged the flowers, and we had the space for a couple of hours. My wife and I bought a bundle of flower arrangements, including a large “spray” that rests on the casket itself. But I was most floored as I read the cards attached to each flower display and found one that said “From the Director and Staff of Johns Hopkins University Applied Physics Lab.” I’d told the office about my mother’s death and that I would be out all week because of the funeral, but I hadn’t given them any details beyond that. Somehow they’d learned where the funeral was, and my office had sent flowers to my mother. I broke down then, it was the first real cry I’d had since her death. Even now I choke up thinking about that. It’s a silly thing, flowers from your office, but it meant so much to me at the time and still does. Knowing that in a tiny way my mom touched the people I work with on a daily basis hundreds of miles away, though she’d never met them. They brought her to the church on Wednesday for the funeral service. They brought all the flowers as well. The funeral director, Glen, played the piano for the hymns we sang, the ones my mom had requested. I’m not religious, I’m proudly atheist. But I sang them for her, because it’s what she wanted. Three different pastors spoke, all men that had run the church she attended for over forty years. While I don’t know the newest one, who spoke last and (in my opinion) spoke least about my mom and mostly about sin and Jesus, the other two I’d met before, and both told beautiful, personal stories about my mom that were lovely. A funeral should be about the person who has passed, not a chance to save another soul or two. Though I don’t share their faith, I respect both men for the honor they gave her and their admiration for her. As part of the “package” of things offered by the funeral home, they handled the obituaries in the local papers, put together a slide show that was shown at the viewing and the service, and created commemorative markers (even bookmarks) of the deceased. Like I said, it is a strange and interesting industry, and Glen and Rachel are very, very good at it. You have to be sympathetic and understanding without being creepy and weird, all while trying to convince a grieving family in a polite way to spend thousands of dollars on the death of their loved ones. I admire that they are able to juggle those qualities adroitly and have cared for my family with such skill. I wonder, too, how much of that skill is learned and transferable, shared by others in the industry. They are remarkable people, who surround themselves with death and grief and yet seem to have such joy themselves. We will have to return in the spring. The thing about Maine is, the ground freezes into a concrete-like structure in the winter. My wife observed this first hand when we parked on the church “lawn” for the service and walked across what should have been an expanse of grassy ground, but which felt as hard as a sidewalk. It’s impossible to dig a grave. The funeral home will keep her in their vault until spring, another service they provide. On May 18th, we’ll see her placed in the ground next to my brother, a mother finally returning to be with her eldest and most dear son. She loved us all, but Stephen was her first and, in so many ways, a special man. I’m glad they’ll be at peace together, though I miss them both terribly. I’m sure my family doesn’t understand that last part. That I do miss them. That my separation from them is not because of a lack of love, or respect, or pride in the roots I come from. It is because of how I am built mentally, how uncomfortable I am around almost everyone I’ve ever known. Even my closest friends from high school. I don’t avoid them because I don’t care about them. I avoid them because of the weird pain I often feel when I’m in the presence of others and have to interact with them. That sense of constant discomfort that roils my guts. I’m okay with who I am now, I understand this part of me. I’m not sure my family does or ever will, and I don’t really feel the desire to explain it to them. It is what it is, and I’ll forever be the son that is considered a bit “stuck up” about his ancestry, the poverty he grew up in, the family that he sprang from. None of which is actually true, but at nearly 51, meh… it’s fine. I accept their indictment of me. I know I should do more and be better at being a son and brother, so the indictment is not unwarranted. Embrace life. Embrace death, for it is another part of life. And death is so often what brings us all together again in joy and peace. I love you mom… always and forever. Totally understandable, aunt Judy, and we never doubted any of that. We love you, too.